Showing 1 - 1 of 1 Products for Air Filter Wrap. Guard your Ram-Air filter with an extra layer of protection from Banks prefilters. Stitched from breathable materials, these prefilters not only keep your Ram-Air filter cleaner, but they also extend cleaning intervals. 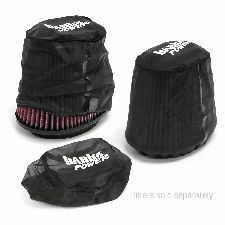 They are easily installed--simply slip them on and they provide your rig with cleaner air to breathe! Cleaner air equals more power, so before the debris and dust gets to your filter, put an extra guard on duty--Banks prefilters--and maintain your Ram-Air superiority!